You may beg to differ, but this has to be one of the most striking cover arts I’ve seen on a game in a long while. I love the big bold colors, dark outlines and the composition. Scoville is the type of game in which you can try many different strategies over many sessions, slowly uncovering the approach that best fits your style of play or curiosity. I find that games that immediately present different avenues of approach to be immediately gratifying. I can’t help but want to give the game another go the instance the game ends. 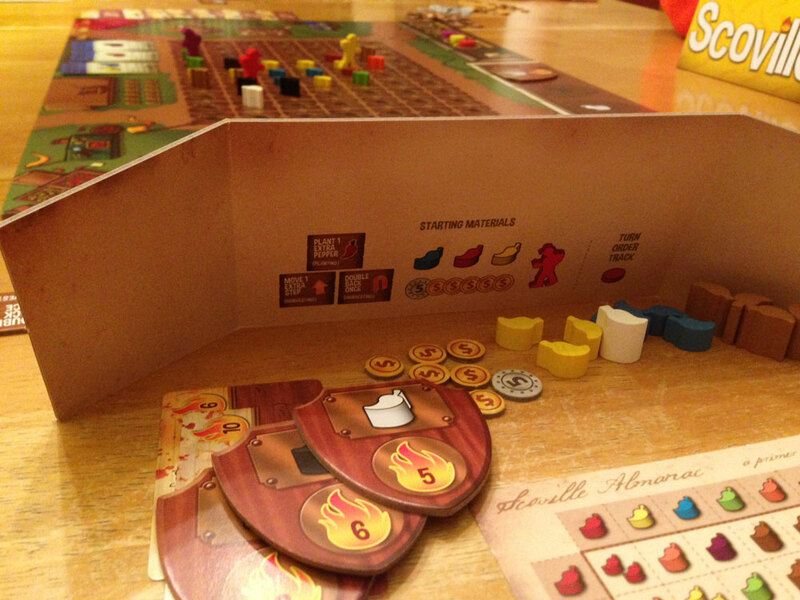 The primary “engine” in Scoville is collecting, planting and spending or cashing in peppers of different colors. There are just a few ways to gain new peppers. You gain one or more via an auction at the beginning of the round. You can gain a few through the farmer’s market, which are a trade-some-get-some (of a different color) mechanism. And you can get peppers by harvesting them in the field, which is the primary means of collection. By moving your farmer between peppers in the field shared by all players, you collect a hybrid pepper or two along the way, often of a different color. Moving between two yellow peppers yields two yellow peppers, while moving between two greens yields a single black pepper. There are 100 cross-breeding combinations and a handy player aid spells it all out, though there are not enough of them — oddly — for a five- or six-player game. Indentations in the board are perfect for gamers who like their peppers to be perfectly aligned on the playing surface. The holes also minimize shifting pieces when your clumsy friends bumps the table on his way to the snack table. 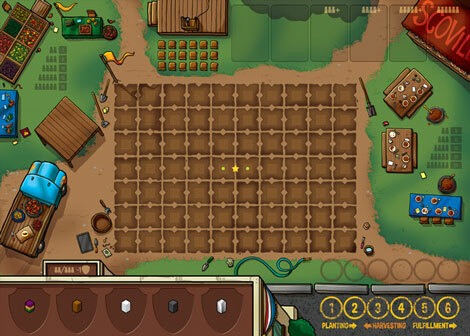 As soon as you have a stash of one or more peppers, you can plant one of them into the field each turn. 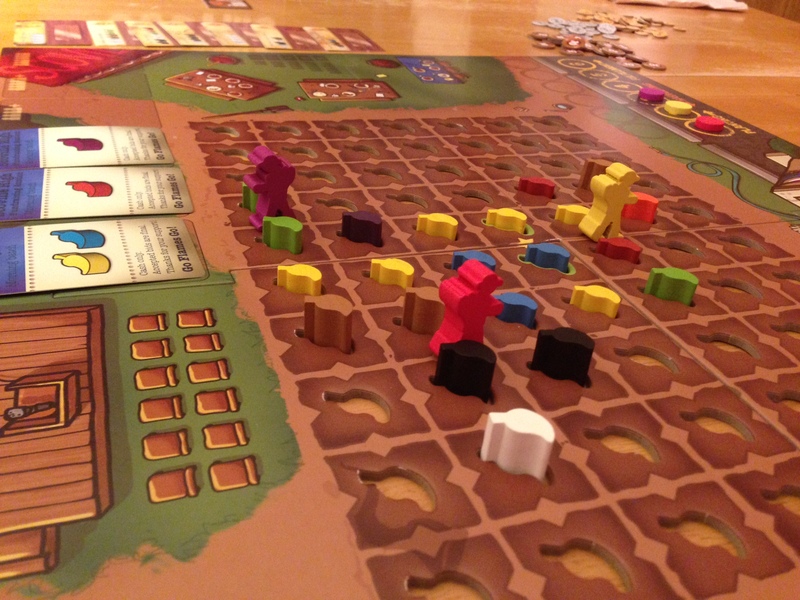 In this way the field slowly matures into a patchwork of different pepper colors on a grid, opening up myriad options on where to move your farmer to maximize your collection strategy, or to diminish (or even block) your opponent’s. 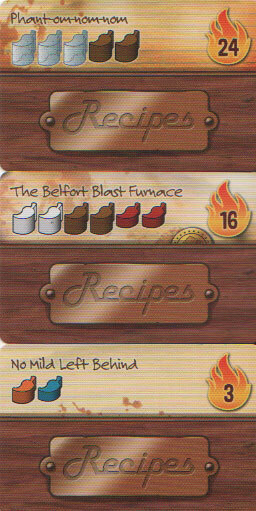 In a 3-player game there will be 12 of these recipes chosen randomly and lined up along the board’s edge. Will you go for quantity, quality or a combination? Note the victory point values in the upper-right corners. 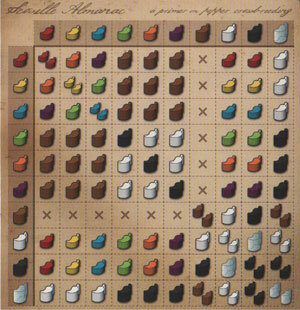 Inevitably, you’ll end up collecting enough peppers of different colors to allow you to begin claiming some chili recipe cards or market cards. (These are seeded into the game based on the number of players at the start.) The recipes with the most victory points require greater numbers or variety of peppers, or the rarest of peppers, such as the coveted “ghost pepper.” These rare breeds require a harvesting and planting approach that will span many turns. When your opponents are doing the same, that is scheming for the same chili recipes or coveted peppers as you, the player interaction is afoot. The game is divided into a morning and afternoon with an intuitive “trigger” (counting the number of market cards and/or chili recipes remaining) that moves the game along into the afternoon phase. Game segments are simple, with an auction phase beginning each turn to determine turn order. There’s also a nifty aspect to this turn order that deserves mention. Whomever is first in the planting phase ends up last in the harvesting phase. Yes, you may be able to plant your pepper exactly where you want it, but another player may be first to harvest that coveted hybrid pepper (and maybe even block your access to) the one you wanted. In the end, it’s all about the victory points you’ve managed to rack up during the course of the game. You get points for your chili recipes, your leftover money (1 point for every 3), award plaques (for being the first — and sometimes second or third player — to plant specific pepper colors), market cards, and for unused bonus action tiles (everyone begins the game with three of these). The beginning of my hot pepper empire. Notice the player screens to hide your stash from prying eyes. There are just a few things I didn’t like, but these had nothing to do with the mechanics. The cardboard coins are a bit too dainty for my man hands, the largest denomination being only slightly larger than a dime. Also, the very cool farmer meeples were a little unsteady when resting on the creases between the four boards that comprise the playing surface. There is a very slight warping of the boards where they meet in the middle. Finally, as I mentioned above, there are not enough cross breeding charts to go around in larger games. These are very MINOR things and in no way should they detract you from buying and enjoying this excellent game from Ed Marriott, which happens to be his first published game. If Scoville is any indication of future performance, I can’t imagine the awesome games we have to look forward to from Marriott in years to come. I really liked this game, but you should know that it will require your utmost concentration. At times there was a degree of analysis paralysis due to the seemingly endless ways to approach getting the quantity and colors of peppers needed long- and short-term. There is a lot to think about here, but that is also why there is a tremendous amount of re-playability and excitement among my friends to break out Scoville again very soon. Not only that, it’s a breeze to teach, and the rulebook is nicely illustrated, clearly written and includes pertinent examples. 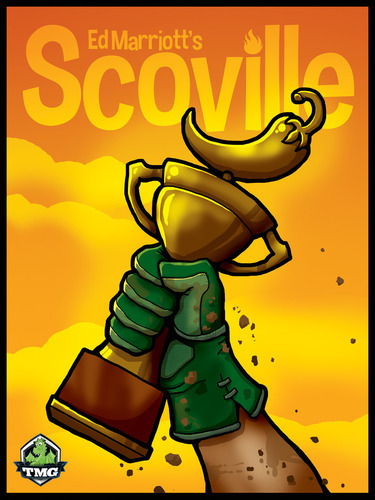 Look for Scoville to appear in your local game stores later this year. Those brown peppers can be a bit of dud in the cross-breading department, but then again, you can always turn in up to five like-colored peppers for cash each turn.